letter, and expert writing tips to tailor it to your own specific situation. – Candidate is applying for a Social Media Manager position. – Candidate has 5+ years of experience. 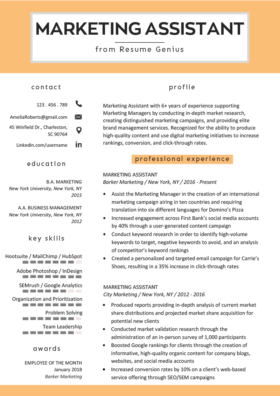 – Candidate has experience with content marketing, branding, and digital copywriting. 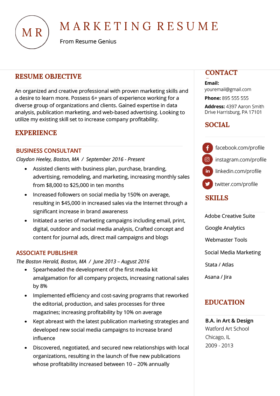 Marketing professional with 5+ years of experience in social media management, content marketing, and branding. Possesses a B.S. in Marketing and expertise in marketing analytics. Excellent communication skills for outreach and digital copywriting, ensuring strong brand presence. A social media role can cover a wide spectrum of tasks and responsibilities. That’s why we suggest you use a career objective. One of the four different resume introductions, a career objective gives you a chance to emphasize your relevant skill sets and expertise for the position at hand. This way, hiring managers can instantly recognize what you bring to the table without having to scan through your entire application. 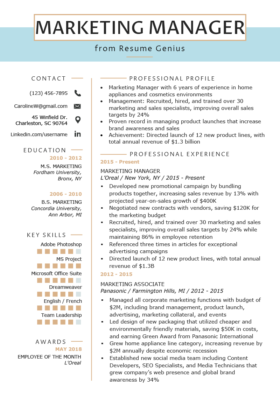 Marketing professional with 6+ years of experience in social media management and branding. Possesses a B.S. in Marketing and expertise in marketing analytics. Excellent communication skills for outreach and digital copywriting, ensuring strong brand presence. In just a few short sentences, the candidate is able to highlight seven skills and abilities that qualify them for the position. This gives the employer a quick overview of what the candidate specializes in and indicates what they can expect in the rest of the resume. Did you know there are four ways you can begin a resume? Learn which one is best for you with our guide to starting a resume. Looking for more? Find every resume action verb in the universe. Social Media Marketing can be a technical role in that it has a lot to do with driving traffic to your website and analyzing user interactions. By now most people know how to navigate through the web and social media platforms, but what sets you apart as a social media marketer is that you are able to leverage those platforms to get results. That’s why it’s important that you ‘prove yourself’ in the professional experience section of your resume. By adding numbers to a few of the bullet points, the candidate above demonstrates their ability to make an impact and achieve impressive marketing results. There are many social media tools these days to help marketers with their content schedules, social media management, brand campaigns, and marketing analytics. Keeping up with the best apps and tools is advantageous when it comes to being a successful social media marketer. Since hiring managers want to know that you are up to speed on the helpful tools in the industry, it’s essential that you include the ones you know how to use in the additional skills section. Hootsuite offers social listening with weekly analytics in addition to publishing, scheduling, and engagement features. Its platform allows you to easily view multiple social media accounts at once and collaborate with other team members. Buffer is similar to Hootsuite as it also offers analytics, scheduling, and posting to several accounts at once. It’s easy to navigate and you can manage your social media posts by dragging them around to modify the schedule. Buzzsumo lets you discover what is the most popular content, showing the content analytics as well as influencer identification. Crimson Hexagon is an excellent tool for your social media analytics. It delivers comprehensive insights through its analytics and offers social listening and influencer identification. Though a bit on the pricier end, it includes unlimited users and access to historical data. Bitly URL Shortener is great for shortening your link URLs, especially in tweets where there are character limits. It shows the number of clicks through that link from your social media post and if you have an account, it keeps track of all your URLs and history. Feel free to browse other social media tools that you could use. If you follow the four tips above, you will be well on your way to writing a compelling social media resume. If you have any questions, feel free to comment below.